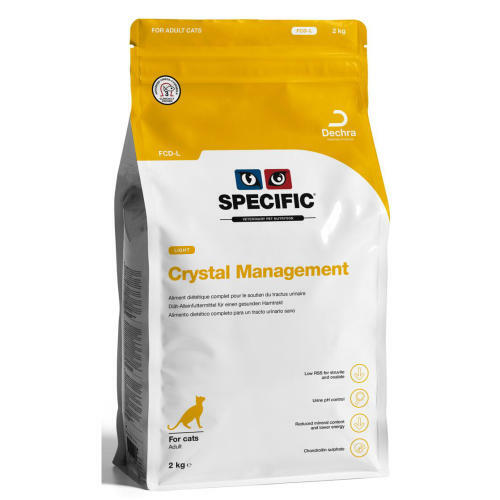 SPECIFIC FCD-L Crystal Management Light Adult Cat Food is a dry food that's been specifically formulated to help prevent the reoccurrence of struvite and calcium oxalate stones. Providing moderate energy levels this diet is ideal for cats needing to control weight. A moderate sodium content makes it suitable for long term use. Creates a more acidic urine, helping to dissolve struvite stones. Has a reduced mineral content, particularly magnesium and phosphorus, to help prevent crystals re-forming. Has a moderate energy content to help maintain ideal bodyweight. Moderate salt content making it safe for long-term use. Contains Omega-3 fatty acids from fish oil (EPA & DHA) for healthy coat skin and joint.